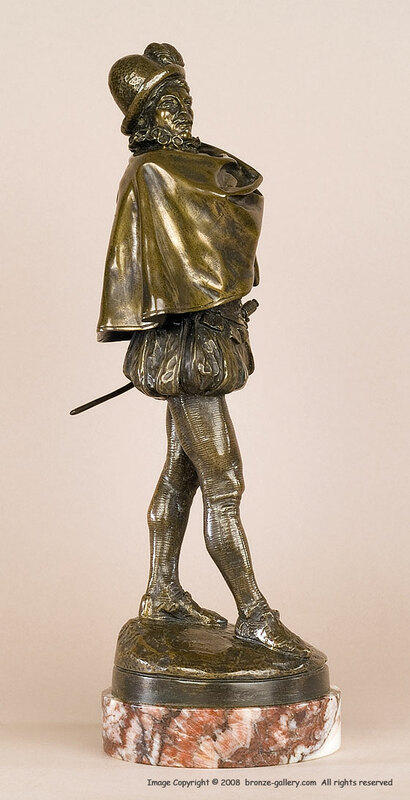 Fremiet was best known for his Animalier bronzes but he also did a large number of human figures, from Roman warriors and charioteers, to Arab soldiers and military figures, and including well known French royalty. 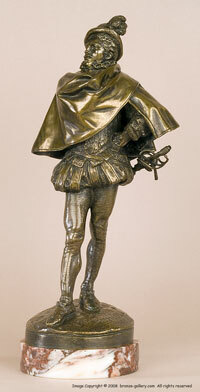 This fine large bronze depicts Henri III as a duelist with his sword at the ready. His body is turned at an angle, with his cloak abut his shoulders and one foot forward to keep his balance. With his fine clothes, he stands arrogantly with his head held proudly and waits for his opponent. The bronze is very detailed and shows all the workmanship in the clothing and ornaments, it has a rich brown patina and is mounted on the original 1 1/8" tall rouge marble base. The sword is made as a separate piece and it can be removed from the scabbard. It is the original sword, which is many cases is lost over time. A top quality and very rare Fremiet model that shows the genius of this sculptor's work.